This fun-to-drive SUV is about more than just good looks and driving dynamics. Safe, practical, and fuel-efficient, the 2016 Mazda CX-9 checks all the necessary boxes, and looks great doing it. Anyone who hasn't noticed the auto industry’s shift to a serious love affair with compact crossovers has been living under a rock. Proof of his shift from three-rowed, larger SUVs was Mazda’s dismissal of the CX-9 model. And although the smaller CX-5 and even more compact CX-3 are thriving and winning awards left, right and centre, the Japanese automaker made the decision to bring back the larger CX-9. The Mazda CX-9 was always poised to make a triumphant return, and we’re pretty sure this will be its time to shine. The wait is finally over, and the all-new 2016 Mazda CX-9 has arrived. We were first introduced to the 2016 Mazda CX-9 at the 2015 Los Angeles Auto Show, and what an introduction it was. Most noticeably, the all-new CX-9 features a revamped exterior that’s directly in line with the rest of the KODO-bred Mazda lineup. This SUV is now much more sophisticated and more grown-up looking, for sure. 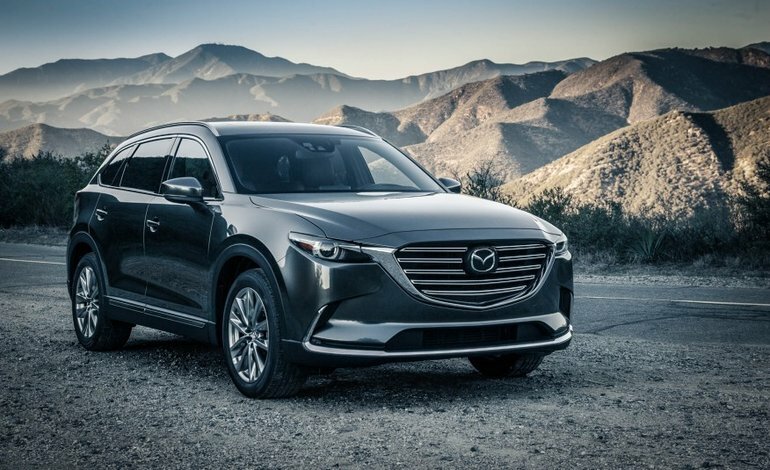 Not immediately noticeable, but definitely a major factor in the CX-9’s all-new look: this second-generation Mazda SUV was actually made shorter than the outgoing model, but also features a longer wheelbase. This gives the Mazda CX-9 shorter overhangs in the front and rear. Also, the rear passenger doors were made larger which means rear passenger entry and exit is much easier now. This more muscular design of the all-new 2016 Mazda CX-9 gives it a decidedly sporty flare, and all that toning and tightening up also means it’s now lighter. A lighter vehicle offers up better driving dynamics and performance, as well as better fuel economy. Oh, and let’s not forget all the sound-deadening materials Mazda threw into the 2016 CX-9 to make the cabin uber quiet. For the 2016 CX-9, Mazda’s made the return to a SKYACTIV-G 2.5L turbocharged mill under the hood. This spooling mill pushes out 250 horsepower (with premium fuel; 227 ponies with regular) and 310 lb-ft of torque. That’s right: all that power for an SUV that seats up to seven. Power is handled via a 6-speed automatic transmission, and can be sent to either the front or all wheels, depend in on which model you choose. Contact us at your local City Mazda today to speak to one of our experts about the all-new 2016 Mazda CX-9 and find out more about everything it has to offer. While it won’t be in showrooms for a little while longer, make sure you book a test drive when they do arrive.